As City Hall staffers work on improvements to Vision Zero View, hopefully they’re taking cues from Transport for London’s collision map. 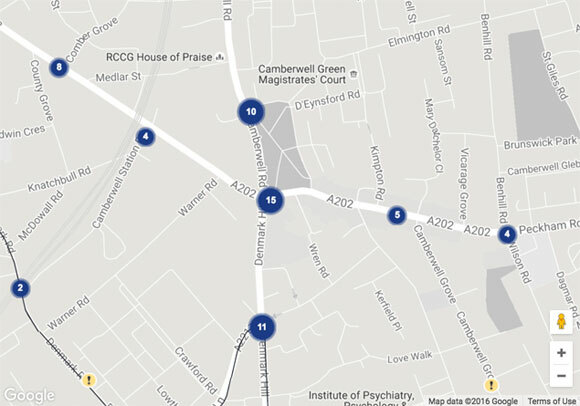 Launched last September, the TfL map “shows traffic collisions that resulted in personal injury and were reported to the police” from 2005 through 2015. Summaries of individual crashes include vehicle types involved, the time of day each crashed occurred, and information on resulting injuries. 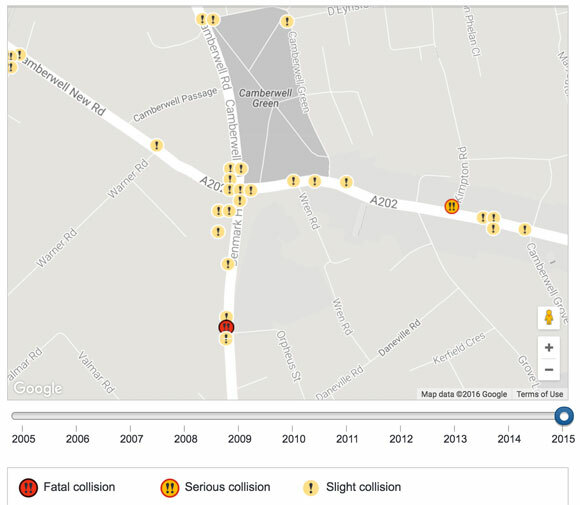 On 04 February 2009 at 09:40:00 a collision occurred at Brixton Road junction with Groveway in Lambeth involving a light goods vehicle and a pedal cycle. An adult pedal cyclist was slightly injured. One significant advantage of Vision Zero View, meanwhile, is that data is updated each month, while London only posts annual datasets. The current NYC map also includes info on street safety measures and speed limits, and categorizes injuries per square mile broken down by police precinct, city council district, and community district. …while the TfL map clusters crashes together unless you zoom in to the tightest level. Another superior aspect of Vision Zero View is that you can see specific crash locations even if you’re not zoomed in very far — you have to zoom out a few levels to trigger the “heatmap” mode — while on the London map, you have to go in tight to see individual crashes. It’s easier to get a sense of dangerous locations looking at the NYC map. Still, there are very useful details in the data made public by TfL that NYC should emulate. Just to add, TfL also make the source data available so it is possible to do your own data crunching if you don’t like the view presented by the website.